Thomas Downing’s work explores the formal possibilities of color and space when freed from its traditional associations becomes the sole subject of his compositions. He developed his distinctive style of circles of varying hues and sizes which appear to float within the undefined space of raw canvas. 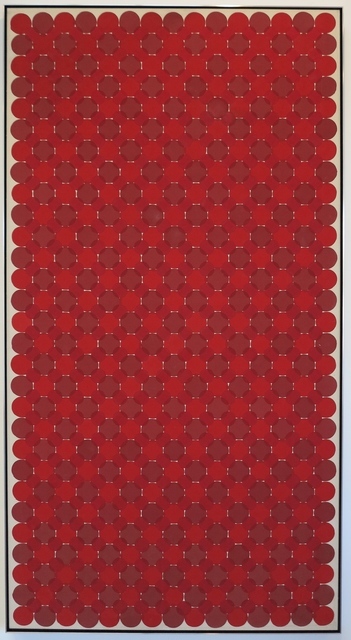 In 1959 Downing first began using the small dot in his work, a motif he explored fully into the 1970s. In the early works colorful dots determined the structure of the painting in their size, position, and repetition within a grid. Often there was a sense of concentration and expansion of the composition from the center to the edge of the canvas, achieving a visual impression of expanding open space. 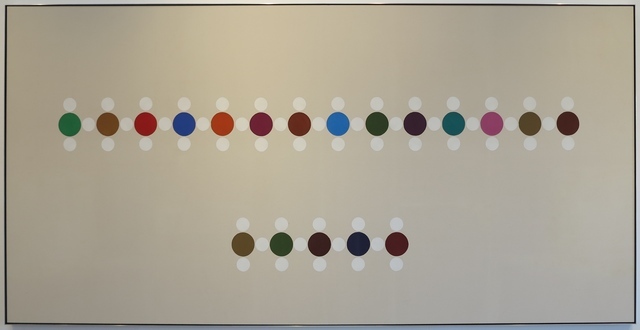 Looking for the fusion between the grid and color, Downing eliminated overlapping dots in 1962. Using free floating dots to provide a sense of projection from the surface, Downing was able to break the grid free of the square format of his painting. Downing’s position in the Washington Color School came from his consistent approach to color. The canvas was the receptacle of color, on which Downing worked often with tonal modulations of a hue. 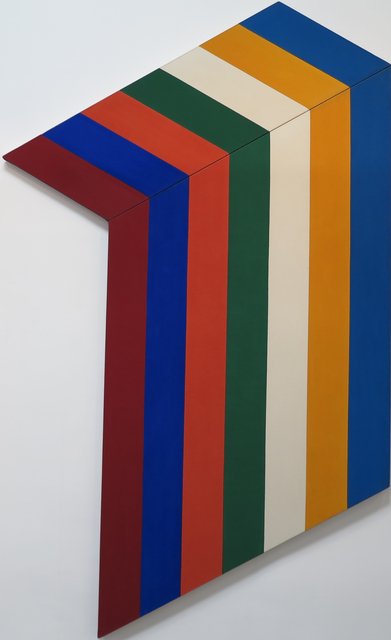 Downing developed shaped canvases in 1966 as a structural solution to his deeper consideration of the “spatial definition” of color. Downing’s first shaped canvases examined the illusionistic qualities of color. He exhibited these works in a solo exhibition at the Corcoran Gallery in 1966-1967 and later at the Allan Stone Gallery in New York in 1967. 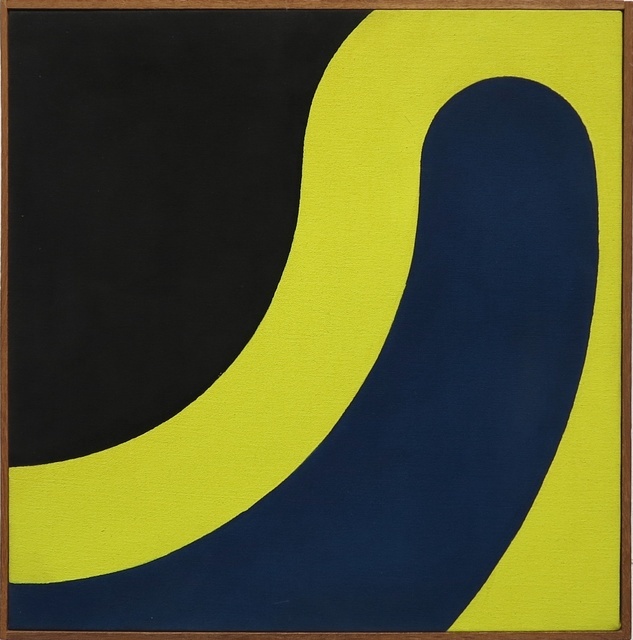 Downing’s second series of shaped canvases titled Folds were created in 1968. In the Fold series he discovered a new effect of relief and spatial depth within a flat work that could be enhanced by color. The projections and folding in the Fold paintings suggest the paintings exist in a world without gravity. Downing taught at the Corcoran School of Art and Design, Washington, DC from 1965 to 1968. There he was influential for the next generation of DC color artists including Sam Gilliam. He moved to New York in 1970 and taught at the School of Visual Arts. He then accepted a position at the University of Houston, Texas in 1975. Around 1976, Downing moved to Provincetown where he continued to paint until his death in 1985. Downing’s works are in many collections including the Whitney Museum of American Art, New York, NY; the Smithsonian American Art Museum, Washington, DC; the Hirshhorn Museum and Sculpture Garden, Washington, DC; the North Carolina Museum of Art, Raleigh, NC; the Norton Simon Museum, Pasadena, CA; and the Oklahoma City Museum of Art, OK.